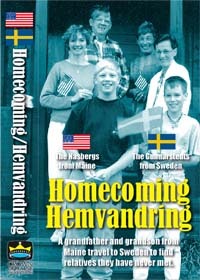 Homecoming, which features beautiful footage from Sweden, tells the heartwarming story of an American grandfather, Don, and his grandson, Wes, who travel to Sweden to meet relatives they have never met. It has been more than 100 years since Don and Wess ancestors left Sweden for America, but this film shows that time and distance mean nothing when it comes to renewing family ties. Experience their joy as they meet for the first time at the train station in Lulea, their excitement as they travel together to see the Arctic Circle, Midsommar activities, Storforsen (the fastest flowing falls in northern Europe). Re-live their nostalgia as they tour Gammelstad (an old church village) as well as the old family stuga on an island in the Baltic Sea. Feel their sadness as they part at the end of a wonderful week. Thirty minutes.